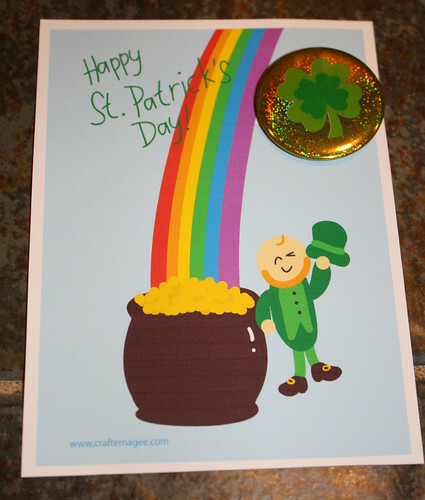 The Valentine's Day printables were so fun to make, that I thought I'd try my hand at some printables for St. Patrick's Day. I have created a poster and some postcards that can be printed out, hung up, or given away to ones you love. Remember that these files are for personal use only. After printing out some of the postcards, I decided to spruce them up by punching two holes in the cloud and adding a button to it. 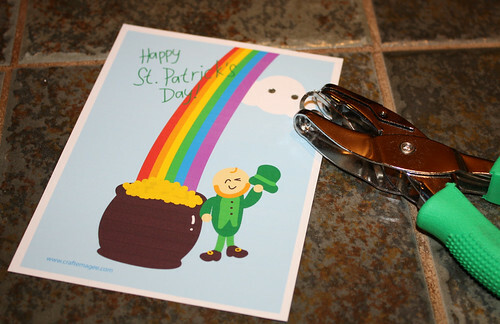 It will make a really nice little token of luck for friends and co-workers on St. Patty's Day! 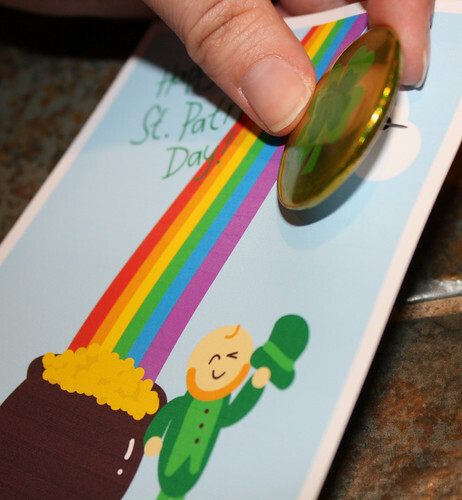 You could always attach candy instead, like a foil wrapped chocolate coin. Of course, giving them to friends without these little tokens is fine too! Enjoy! 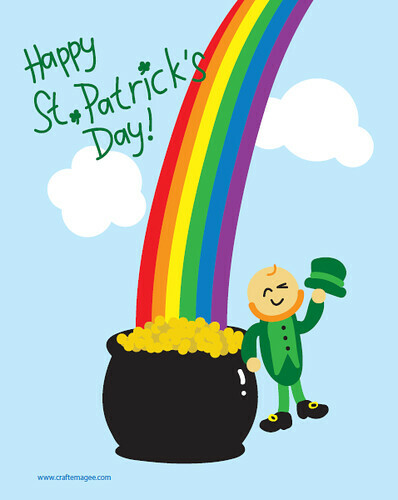 A wishin' of the luck to you all! For Beatrice's hair, I decided to go with braids. 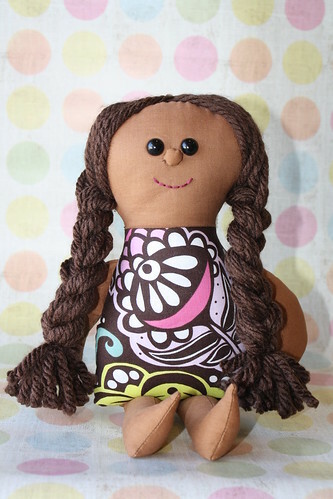 I think she looks so adorable with two pig-tail braids and a button nose. 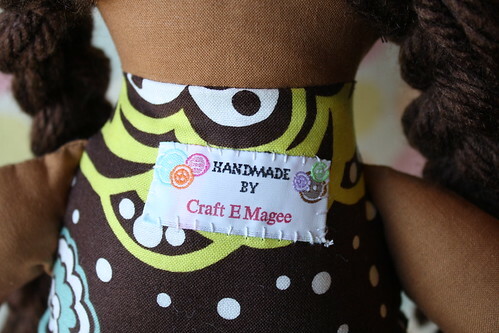 I was able to use some of my new sewing labels on Beatrice, Callie, & Bianca, and I love the way they look! 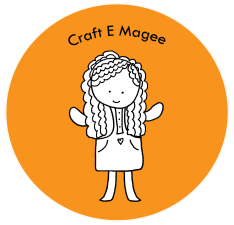 I will post more about the new sewing labels and other Craft E Magee swag soon! 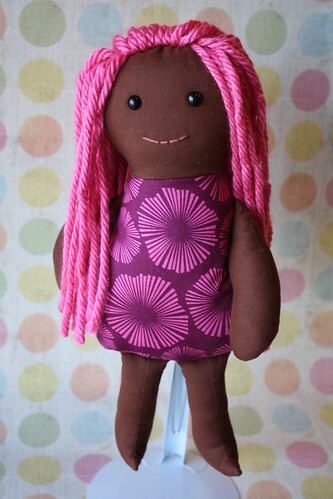 Callie has beautiful brown skin and bright pink hair to match her purple and pink jumper. She is such a happy little doll and I love her very much! I have an internal debate as to whether I should give my dolls noses or not. I really love how sweet Callie looks with just a smile and bright eyes, but I do think Winnie and Beatrice look great with little noses. What do you prefer? A nose, or no nose? I really value my weekends. Not only is it the most relaxing time of the week for me, but it is also when I have the spare time to be creative. I like my job job, working for a non-profit organization for girls, but my position doesn't exactly allow me to express my creativity. 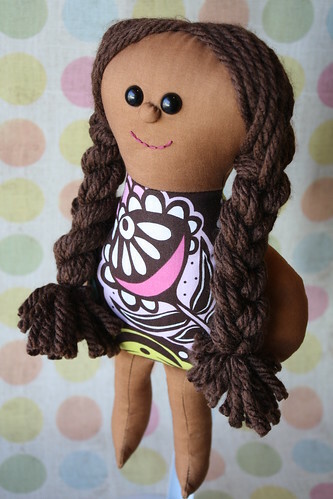 I am very excited that this weekend I was able to complete 3 dolls! Meet Bianca. She is cute little girl with a floral print teal dress. Look how adorable she is, even just lying around! I think this picture shows her coloring better. 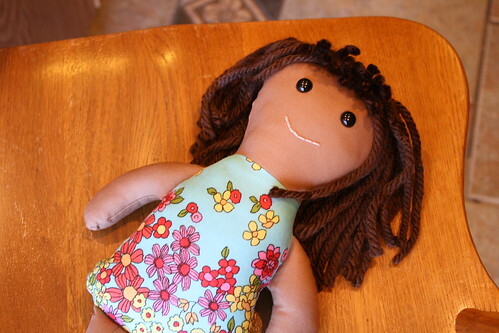 She is tan complected and has rich brown hair. 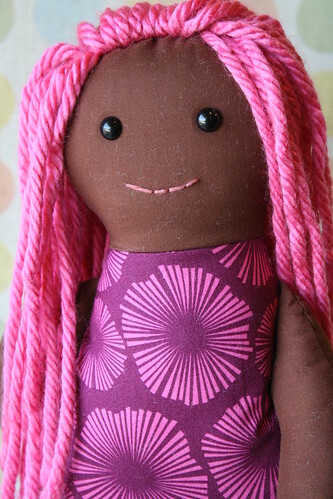 I just love the movement of yarn hair. It's so fun! 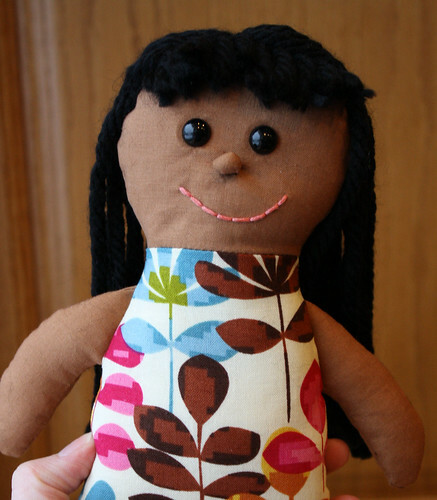 Meet my most recently finished doll, Leilani. 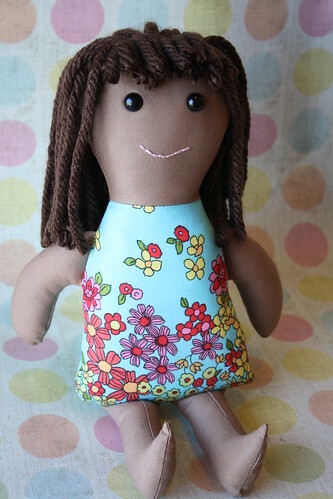 She is the smallest doll I have created, so I'm calling her a "mini" doll. I love her tropical print outfit and dark black hair. She's got a cute button nose too! I think Leilani is the perfect expression of the crazy warm Spring-like weather we are having! Today it was 69 degrees Fahrenheit in Louisville, KY. In February! 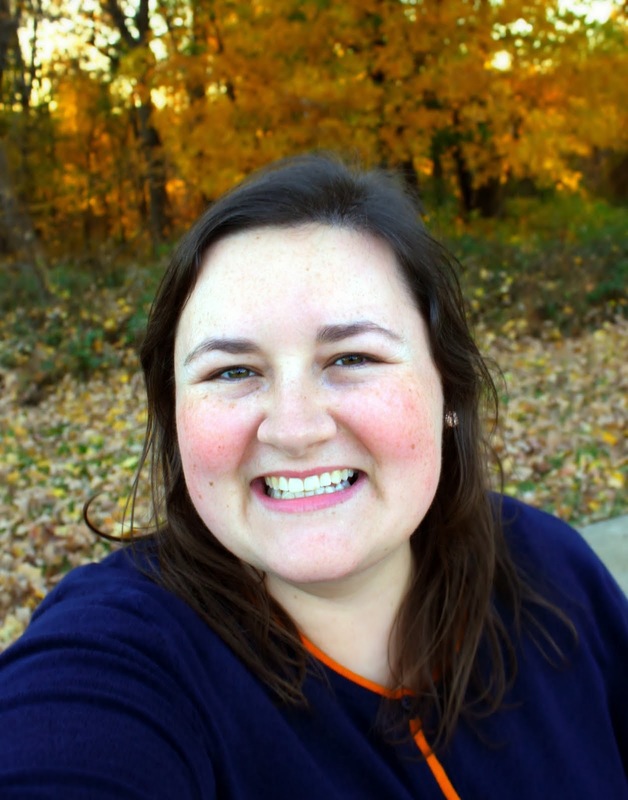 It is totally out of the ordinary, but I will take warm weather over the cold any time! 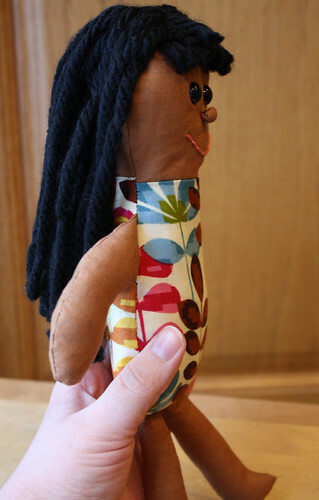 I have some more dolls and projects to be sharing soon. I just need to finish them up and snap some photos! Stay tuned. Apparently I caught that flu bug going around because I was super sicky last week. Before getting sick, I was able to work on some crafty projects that I will be revealing soon. I just need some good 'ol sunshine to show up so that I can take some nice photos of everything! Luckily our state hasn't been affected too much by Winter Storm 2011 yet, so at least there's that! I'll leave you with a query from my 3 year old nephew. He asked, "Why is it snowing if it's not Christmas anymore?" Good question!